Lesotho’s population is largely rural with approximately 72% of the population living in rural areas (Ministry of Local Government and Chieftainship Affairs 2015). The capital city, Maseru, is by far the biggest urban area in Lesotho (Table 4) (Brinkhoff 2018). The census data for urban populations in Lesotho for 1996, 2006 and 2016 show that there is substantial migration from rural to urban areas happening in Lesotho (Brinkhoff 2018; Ministry of Local Government and Chieftainship Affairs 2015; CIAT and World Bank 2018). This migration to urban areas (and the lowlands agro-ecological zone) has been for jobs and because people are unable to sustain their livelihoods in the rural areas (Ministry of Local Government and Chieftainship Affairs 2015). The rapid population growth between 2006 and 2016 has also contributed to the high urbanisation rates (Ministry of Local Government and Chieftainship Affairs 2015; Brinkhoff 2018). Larger towns such as Maseru, Mafeteng and Maputsoe have the largest informal settlements where communities have built in areas where no planning and development guidelines were provided. These informal settlements are often built with cardboard, plastic sheeting or pre-used roofing materials, these are however less common in the urban areas of Lesotho. Urban Lesotho houses comprise of Malaene, Polata and Rontabole housing types. Bungalows and Optak are less common in the urban areas (UN Habitat 2015). Houses built using mud and other natural resources can be found in the mountain towns, though these housing structure are less common in larger towns such as Maseru, Leribe and Mohale’s Hoek. Other housing types in Lesotho are stone houses located near quarries. Corrugated iron built houses are are more common around some of the border gates between Lesotho and South Africa (UN Habitat 2015). Roads, air transport, and some rail infrastructure are the main transport networks in Lesotho. Furthermore, the use of animal transport and pedestrian travel are common modes of travel, particularly in the highland areas. Road transportation provides 70 percent of the total domestic transport needs (Morgan-Jarvis 2018). Due to increased government investment in improving road infrastructure, in the year 2013 Lesotho had approximately 8,638 kilometres of road infrastructure, including some 1,817 kilometres of paved roads, 4,358 of gravel roads and 2,463 of earth roads (WHO 2018). With regards to road conditions, roads are predominantly gravel in lower income areas with higher income areas having tarred roads yet still lacking street lighting, pedestrian walkways and side drains (UN Habitat 2015). Main North One (A1) and Main South One (A2) are the two main roads that provide access to the North and South of the Country. The A1 connects to Caledonspoort and Ficksburg in South Africa while A2 connects to Moyeni (Quthing), Mount Moorosi and the Drakensberg in South Africa (WHO 2018). For transporting goods, a narrow railway infrastructure stretches over 2.5 km between South Africa, Bethlehem and Lesotho, Maseru West. Its main function is to move cement, maize, fuel and freight containers (Morgan-Jarvis 2018). The main challenge facing transport provision and development in the sector is Lesotho’s uneven topography (International Monetary Fund 2012). Heavy rains and other climatic conditions have negatively impacted on Lesotho’s road infrastructure, preventing the transportation of goods, services and people across the country. These conditions impact heavily on other sectors such as Tourism and and the economic sector (International Monetary Fund 2012). Lesotho’s main power generator is the Lesotho Highlands Development Authority (LHDA). LHDA supplies energy to Lesotho Electricity Company, a monopoly transmitter responsible for distributing to the consumer (International Monetary Fund 2012). Approximately 106,000 households in Lesotho receive power from the Lesotho Electricity Company. Additionally, Lesotho also receives some of its power from neighbouring countries such as South Africa and Mozambique, however, only 25% of Lesotho’s population have access to electricity (International Monetary Fund 2012; UN Habitat 2015). According to the Lesotho Urban Housing Profile, households in Maseru and Leribe use electricity for cooking whereas smaller towns use other fuels such as paraffin and fuel wood. The results also show that although houses in urban areas may have greater access to electricity, a large number of the households use other sources of power for cooking (UN Habitat 2015). Overall, the majority of the population is highly dependent on other fuels such as fuel wood, shrubs, animal dung, and crop residue. These fuels play a vital role in cooking and heating particularly within rural households. As a result, biomass fuels account for 65% of Lesotho’s energy consumption, with the rural areas being the dominant consumers. The remaining 35% of the energy constitutes of petro-products, coal, electricity and gas (Lesotho Meteorological Services 2017). The whole of Lesotho (Figure 2) has an extreme veldfire (wildfire) risk (Fraser 2017). This is due in part to the majority of Lesotho being covered by the Grassland Biome, specifically, sour grassland, which is the vegetation type with the highest veldfire risk (Mucina and Rutherford 2006; Forsyth, Kruger, and Le Maitre 2010). Sour grassland is unpalatable in some seasons and so it is easier for sour grasses to accumulate and provide fuel for veldfires (Forsyth, Kruger, and Le Maitre 2010). Additionally, Lesotho is prone to lightning strikes, which increase the risk of veldfires (Gijben 2012). In Lesotho, veldfires are more likely to occur in winter than summer because Lesotho is situated in a summer rainfall region (Forsyth, Kruger, and Le Maitre 2010). However, there are fewer veldfires in Lesotho than on the South African side of the border, particularly on either side of the Drakensberg mountains (Forsyth, Kruger, and Le Maitre 2010). This is thought to be because temperatures are colder in Lesotho and the rainfall is less (the Drakensberg mountains create a rain shadow), which causes less grass to grow on the Lesotho side of the border (Forsyth, Kruger, and Le Maitre 2010). In addition to the risk of veldfires is the risk of lightning strikes. The density of cloud-to-ground lightning strikes (lightning that hits the ground) is shown in Figure 3 as flashes per square kilometre per year (flashes/km2/annum) (Schulze 2007). 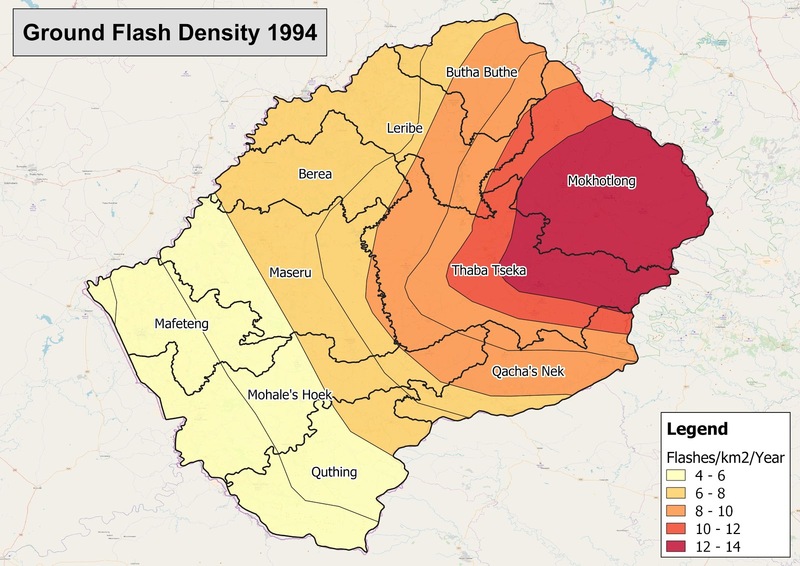 Lesotho has a range of flash densities ranging from high in the east of the country to low in the west (Figure 3) (Schulze 2007). Areas that have greater densities of lightning flashes have a greater risk of lightning-induced fires and damage (Gijben 2012). Most of the Mohale’s Hoek District has a relatively low flash density, however, the eastern part of the District has a medium flash density and thus a slightly higher level of risk (Figure 3) (Schulze 2007). Brinkhoff, Thomas. 2018. ‘Lesotho: Districts & Urban Centers – Population Statistics, Maps, Charts, Weather and Web Information’. City Population. 15 March 2018. http://www.citypopulation.de/Lesotho.html. Forsyth, G.G., F.J. Kruger, and D.C. Le Maitre. 2010. ‘National Veldfire Risk Assessment: Analysis of Exposure of Social, Economic and Environmental Assets to Veldfire Hazards in South Africa’. CSIR/NRE/ECO/ER/2010/0023/C. Stellenbosch, South Africa: CSIR. https://www.westerncape.gov.za/assets/departments/local-government/Fire_Brigade_Services/For_the_fire_service/veldfire_risk_report_v11_0.pdf. Fraser, Stu. 2017. ‘Wildfire Global CSIRO 30-Year Fire Weather Climatology’. GeoNode. 2 June 2017. http://45.55.174.20/layers/hazard:csiro_wf_max_fwi_rp30. Gijben, Morné. 2012. ‘The Lightning Climatology of South Africa’. South African Journal of Science 108 (3–4): 44–53. Mucina, L., and M.C. Rutherford, eds. 2006. The Vegetation of South Africa, Lesotho and Swaziland. Strelitzia 19. Pretoria: South African National Biodiversity Institute. https://www.sanbi.org/documents/vegetation-south-africa-lesotho-and-swaziland-strelitzia-19. Schulze, R.E. 2007. ‘Lightning Ground-Flash Density’. In South African Atlas of Climatology and Agrohydrology, edited by R.E. Schulze. Vol. 1489/1/06. Pretoria, South Africa: Water Research Commission. http://sarva2.dirisa.org/resources/documents/beeh/Section%2019.1%20Lightning%20Gr_Flash%20Density.pdf.